From the beginning its 271 horsepower, four-barrel V-8 could do 0-60 in 5.2 seconds! 1972 125,405 250six/98nhp, 302V-8/140nhp, 351/163-248, 266nhp: HO Cleveland! Note: Starting in 1972, the "net" horsepower rating system went into effect and meant that the motors were tested with all their equipment attached, which resulted in lower horsepower numbers, making them appear to have less power than they actually had. 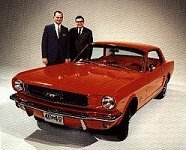 The auto makers had to start lowering compression ratios in 1971 and this resulted in some horsepower loss, but it wasn't until 1975 that muscle cars were dealt their final blow. Compression was lowered even more to allow cars to run on unleaded fuel. Big block engines became extinct, and the smaller engines were so underpowered it was pathetic.